Let’s face it: for most of us starting a conversation among unfamiliar faces is not an easy task. The situation gets even worse when you are pressured to do it in a determined time frame. And that’s often the case when you’re attending events such as conferences and meetups are. A scenario in which you’re standing in a crowded space, knowing you should do something and make contact but repeatedly failing to do so even though you know there’s nothing to be afraid of is typical for newbies at networking. If you are one of them, what you need to know is to take a deep breath and remember: everything will pass, and you will become an expert mingler in no time. If you’re interested in how to mingle at conferences and events, we offered the tips here, so have a look! 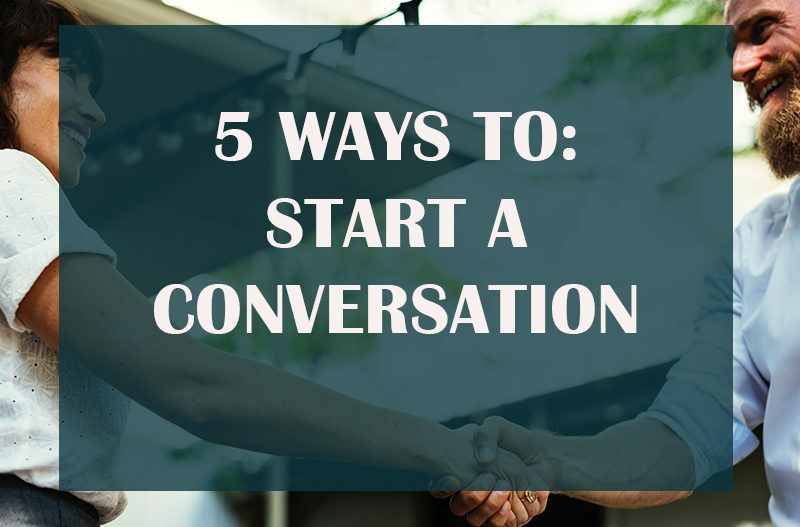 How you’re going to start a conversation depends on various things – the situation, people involved in it, time, etc.… In this article, we’re going to give you a few conversational starting points to break the ice and finally start meeting interesting people. This is the first thing you should try to do. Just think about it, everyone is here for the same reason – to connect. Approaching people is not an unusual thing to do while at a conference, because basically everyone is trying to do the same. Before approaching someone scans the room and find a group or a person that feels most comfortable to start a conversation with. When you finally decide to go and meet them, make it simple and straightforward – introduce yourself with few words about who you are and what you do and the conversation will take a natural flow. While at the conference you will be able to hear some amazing and inspiring speeches. You will be able to get familiar with the unknown things and tackle some questions you were asking yourself. Being among people who share the same passion is a great thing! You will never run out of the conversation topic. If, after some time at the conference, you still have a problem with approaching people and starting a conversation, you might want to approach someone who asked some interesting questions during the presentation. This is a great ice breaker because you will soon forget about how uncomfortable you were by discussing what interests you the most. Sadly, many people live in a wrong belief they should look their best self on events such as business conferences are. However, if you do so, you might come across as the stiff and unapproachable person. The best advice we can give you is just to be yourself. Some will click, some won’t, but you will not feel uncomfortable by not being yourself. Taking a genuine interest in another person story will make networking much more comfortable. As we have already said, everyone came with the same reason and had the story behind. Being approachable and taking a genuine interest in somebody else’s story is a great way to encourage someone to talk. Good side is that you will be able to follow up much easier than your disinterested counterparts. Even if you’re the shyest person in the world and meeting new people makes your anxiety sky high try to hide it. Don’t let your hands give away your feelings and always hold something in them. Smile and try to look straight into the eye. It’s not the most direct way of approaching new people, but by looking open to new acquaintances, you will make them come to you first. And our list came to an end. We hope we gave you a few starting points on how to start a conversation at a conference. Pick the one that suits you the most and don’t be afraid to show what you’ve got. You have the story worth telling, let everyone hear about you!